I know I haven't been posting as often lately, but I've developed a seemingly never-ending cold that has resulted in my attempting to eat garlic and ginger for every meal to try to get rid of it (so far, no luck). I haven't felt like cooking nice meals that I won't even be able to taste, or baking treats for others that will probably just spread my germs to them. Fortunately I still have a few recipes that I haven't shared with you guys yet, and this delicious lasagna is one of them. I actually made it back when I was testing recipes for my Canadian Thanksgiving Week because I thought a lasagna would make a great vegetarian Thanksgiving main dish. While I absolutely loved this dish, I ended up posting a roasted vegetable galette instead because I thought it was just slightly more appropriate for a Thanksgiving dish. I've been waiting for a chance to post the lasagna recipe though, and now with American Thanksgiving coming up this week, along with lots of other opportunities for family gatherings in the coming months, I think now's the time to share this dish that is very worthy of taking center stage at your next family feast. I've actually tried three different versions of butternut squash or pumpkin lasagna before, usually with some sort of white sauce, cheese, and sage, but they always seem to disappoint me because they end up being very one-dimensional in flavour. 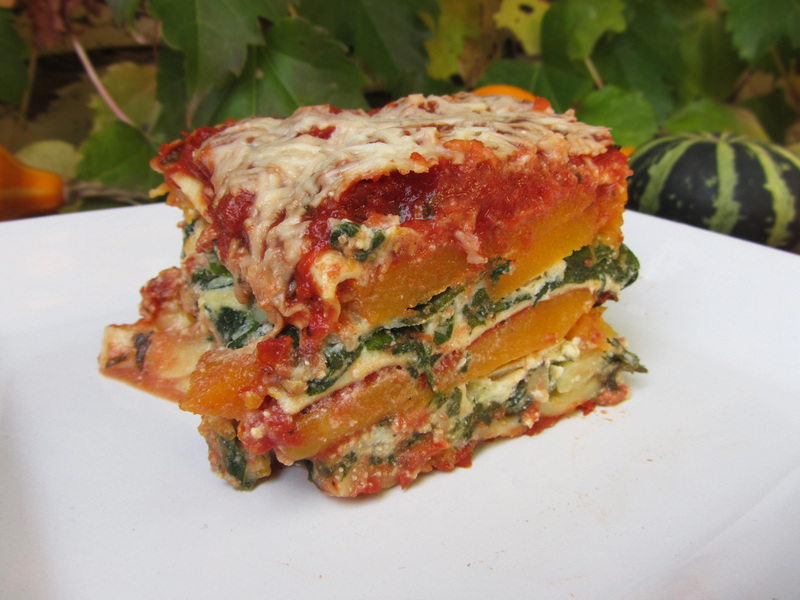 I was intrigued when I saw this recipe for butternut squash lasagna from Cooking Light, because it looked completely different from the other recipes I'd tried by combining squash with a smoky marinara sauce instead the more common white sauces I'd seen. 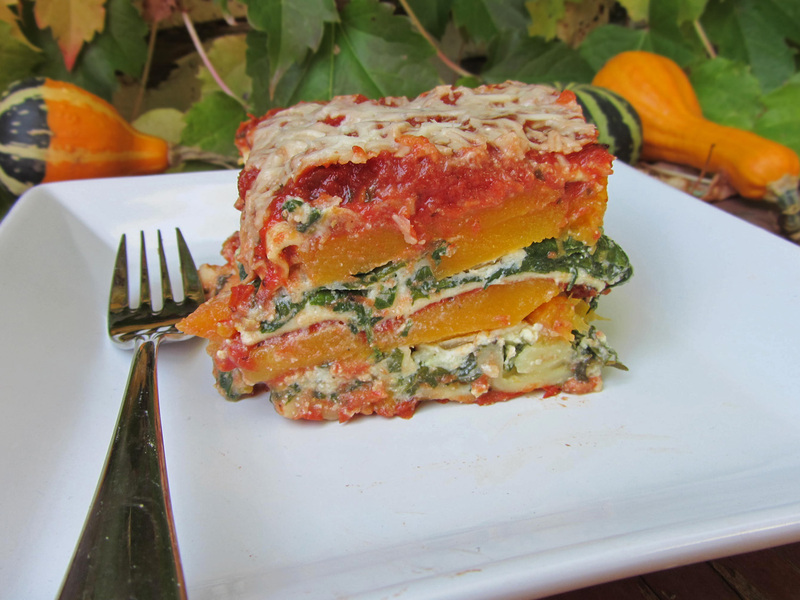 I'm so glad I gave this version a try because I now finally have a squash lasagna recipe with FLAVOUR! The smoky marinara sauce (which you must be sure to buy the fire-roasted tomatoes for) has such an interesting flavour that made it the star of the dish, while still complementing the squash nicely. The provolone cheese added to the smokiness of the dish, and the addition of three other cheeses (ricotta, goat cheese, and parmesan) created a wonderful combination of flavours that was so much more interesting than the more traditional but bland combination of mozzarella and ricotta. I used fresh lasagna noodles so the end product had a wonderful texture, but dried noodles would work just fine as well. The only downside to this recipe is that it's a fair amount of work and contains a lot of ingredients, but I just poured myself a glass of wine and put on some good music to listen to, and I thought the whole process was really enjoyable! Your guests (both vegetarians and meat eaters) will love this impressive and delicious dish, and since it makes a ton, you'll hopefully be able to enjoy the leftovers all week! Preheat oven to 400°F. Peel butternut squash, scoop out the seeds, and slice into thin pieces, about ¼ to ½-inch thick. Spread on a large baking sheet and toss with olive oil, salt, and pepper until evenly coated. Roast in the oven for 30-40 minutes, until soft, but not mushy. Remove from oven and set aside. Meanwhile, prepare the smoky marinara sauce. Heat olive oil in a large saucepan over medium heat. Add garlic, basil, parsley, and oregano, and sauté 1 minute, stirring frequently. Stir in vinegar, salt, pepper, and the cans of tomatoes. Reduce heat and simmer for 10-20 minutes. Remove from heat. Reduce oven temperature to 375°F. Spray a 9x13 glass baking dish with cooking spray. Heat olive oil in a large saucepan over medium-high heat. Add onion and sauté 5 minutes, or until soft. Add garlic, and sauté for 1 minute, stirring frequently. Add the spinach and sauté for 1-2 minutes, or until spinach wilts. Transfer everything to a large bowl. Add the provolone, ricotta, goat cheese, parsley, salt, pepper, and eggs to the bowl and stir everything together until thoroughly combined. Cover with foil and bake at 375°F for one hour. 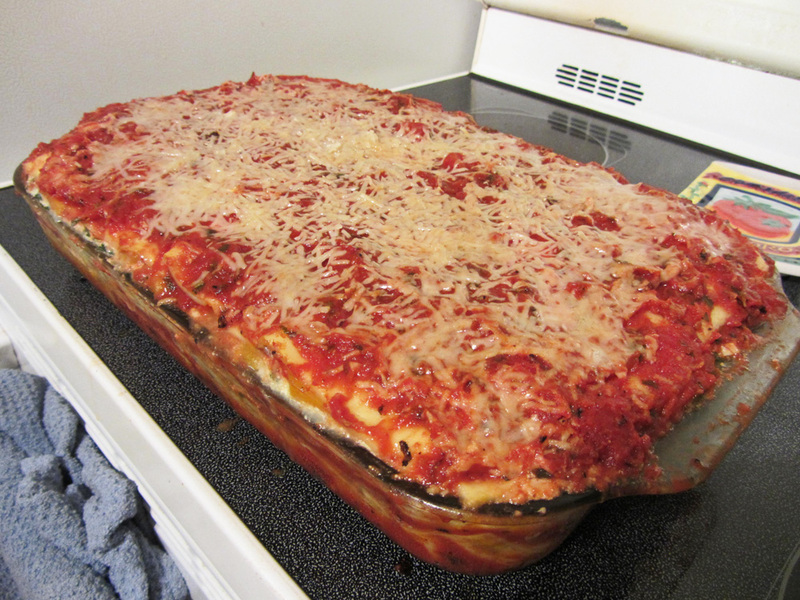 *Note: The original recipe called for the lasagna to be divided among two 8x8 pans. I decided to put it all together in one 9x13 pan instead, which is slightly less total volume than the two pans. This made for a very full lasagna pan, which is why I kept it covered in foil for the full baking time, so that the sauce wouldn’t spill over in the oven (although a tiny bit still did). If you’d rather split the lasagna into two pans, remove the foil halfway through cooking. What a masterpiece! I love how the layers look...and it tasted so good too - definitely a nice hearty vegetarian main course idea!